These were among the many positive attendee reactions for the first of three Veterans’ Health Fairs that Rep. Dan Swanson put on for Mercer, Knox, and Bureau Counties beginning on Tuesday. Mercer County’s event was hosted at the Aledo VFW Post 1571 on Southwest Third Avenue. Dozens of attendees joined dozens of exhibitors representing state, local, and community agencies in providing information to Veterans and seniors in attendance. The VFW Auxiliary hosted a free lunch of hot dogs and chips at the Aledo event. 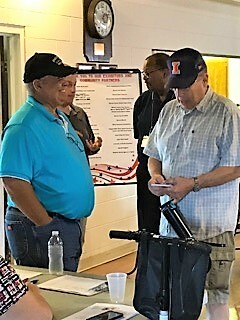 Taking great constituent service on the road, Rep. Swanson next hosted Veterans’ Resources Fairs in Galesburg on Wednesday, August 30th and in Princeton on Thursday, August 31st.